I’ve been in a rut lately as far as meals are concerned. With the weddings and the holidays, I’ve been cooking quick and easy meals that I am getting REALLY tired of. Sometimes, you need to shake things up a bit and make something that is out of your comfort zone. This is one of those recipes for me. It’s not a difficult recipe but the combination of flavors is not something I would normally try. This will definitely be in our meal rotation list. 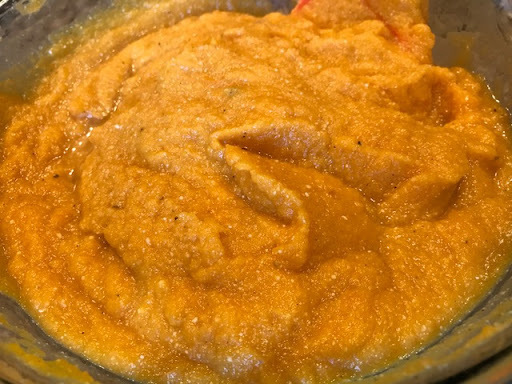 Begin by making a butternut squash puree. Split the squash in half length-wise, scoop out the seeds and place on a baking sheet. Drizzle with olive oil, salt and pepper, and bake in a preheated 375 degree oven for 50-60 minutes until tender. I used a combination of butternut and acorn squash. You could even use pumpkin if you prefer. Scoop the squash from the shells and place into the bowl of a food processor. Process until you reach a puree consistency, adding a little water to thin as needed. Place the puree in a large bowl. Add 4 oz of Ricotta cheese, dijon mustard, and a little salt and pepper. Mix well and set aside. 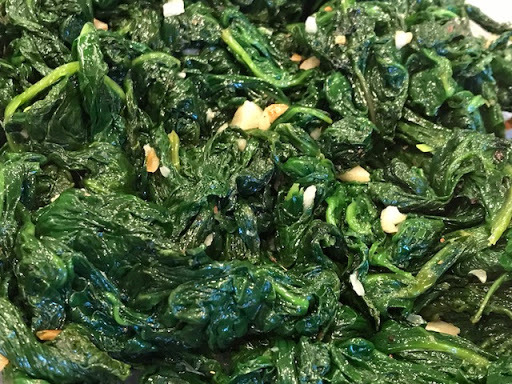 Meanwhile, prepare the spinach filling. In a large pan, heat 2 teaspoons olive oil, add the garlic and cook the garlic for about 30 seconds. Do not allow it to burn. Add the spinach and saute for 5-6 minutes. Next, add the sage, parmesan cheese, and the rest of the ricotta cheese. Season with salt and pepper and set aside. 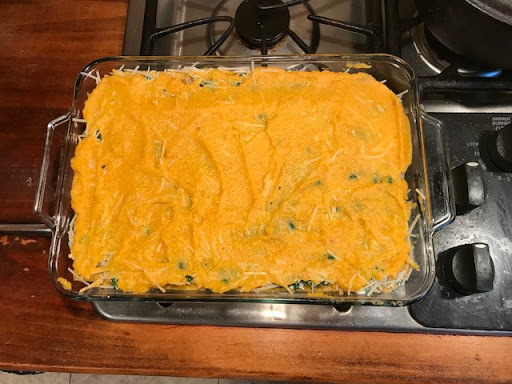 In a 9×13 inch baking dish, spread 1/3 of the squash puree evenly across the bottom. Place a layer of lasagna noodles over the puree. (I used oven ready noodles so there was no need to precook them. If you use regular noodles, cook according to package directions before assembling.) Next, spread 1/2 the spinach mixture over the noodles. Sprinkle with parmesan cheese. 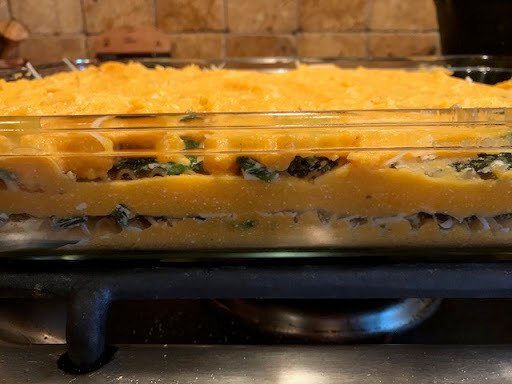 Add another layer of lasagna noodles over the spinach, spoon 1/3 of the squash over the noodles. Add another layer of noodles followed by the rest of the spinach mixture. Place the remaining squash mixture on top of the spinach. Top with 1/4 inch slices of mozzarella cheese. Bake in a preheated 350 degree oven for 50-60 minutes until bubbly and the cheese is melted. 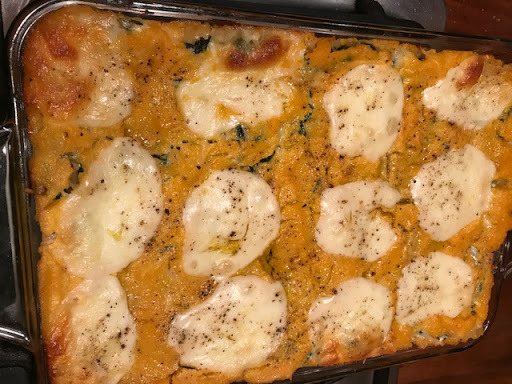 This was so good that even my picky daughter who hates squash loved it! This would be great for a meatless Monday dish.